Withdrawing money from a bank account is easily accomplished--if you have the legal right to access the account. Withdrawals can be made in a variety of ways, including through in-person bank visits and electronic transactions. You can also legally withdraw money from someone else's account with a court order. 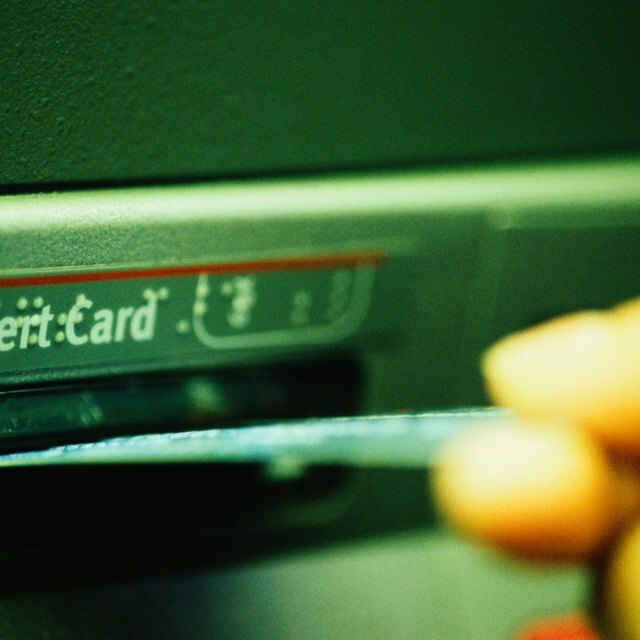 If you have a debit card linked to your checking or savings account, you can typically receive money from any ATM. Insert your card into the ATM terminal, enter your personal identification number and follow the prompts to get cash from your banking or savings account. Bear in mind that you may have to pay a fee if you access a terminal that is not part of your banking network. Check with your bank to see which ATMs are fee-free. At some retail stores, you can "overpay" your total and get cash back. Essentially, you're simultaneously paying for a purchase and making a withdrawal from your bank account. When you buy something at a retail store, ask if they accept debit cards with the option to receive cash when you pay. Swipe your debit card through the card reader at checkout and select the option for "Cash Back." Follow the prompts to pay for your purchase and receive cash from the cashier. The cash will be added to your purchase amount and deducted from your checking account. You can withdraw money electronically by transferring it to another bank account through a wire transfer. You may have to visit your bank to perform a wire transfer, although some allow online wires. Present your driver's license or debit card as identification to the teller, and indicate you want to make a wire transfer. Authorize the bank to withdraw funds from your banking or savings account and wire the money to another account. Information you'll need includes the routing number and account number at the receiving bank. Routing numbers are nine-digit numbers on the bottom left of your checks or savings account deposit slips. The account number appears to the immediate right of the routing number. How Do I Transfer My EBT Cash Benefits From My Bank Account in California? You can transfer money over the Internet using your online banking account. Log onto the system and click on "Transfer Money" or a similar tab. Follow the prompts to indicate how much money you want sent from your account and where. Provide the receiving account's routing number and account number when prompted. If you win a lawsuit against another party in a civil case you may be awarded a judgment. A judgment may grant you the right to withdraw money from the other person's bank account through a procedure called garnishment. A court order signed by the judge is necessary for garnishment.